My father is in ICU, We are broke, I need HelpI hope, from the bottom of my heart, that you read what I have to say. As a daughter, I am compelled to write this and I know this is the only hope for me. As I sit outside the ICU at the Aster CMI Hospital in Bangalore these days, I wonder how we've managed to come all the way from a normal life in Andhra Pradesh and made Bangalore, or rather the Aster Hospital, our second home. I am now beginning to grow familiar with the city, the food, and people, but more than anything, I have grown accustomed to the familiar smell of the hospital. My Father is a 55 years old bank employee, a middle-class family guy. He is a diabetic patient with very low immunity system. He is a very good badminton player. Our family consists of 4 members My Dad, My Mom, My sister (Age 15) and me (Age 24). We are a small family with lots of love and happiness towards everyone. Everything was fine until 1st of July 2018. 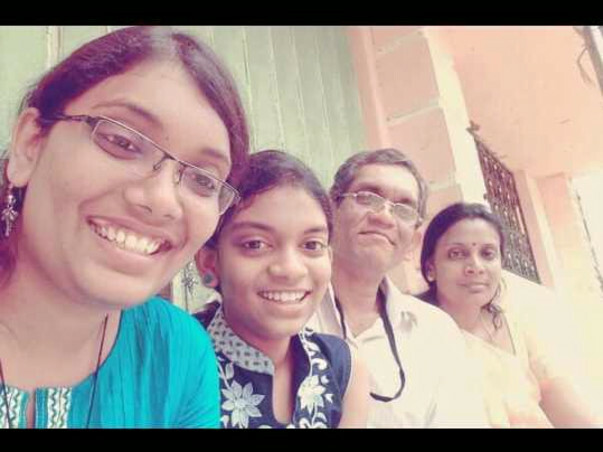 But on 2nd July while my father at work (Bank) he suddenly fell down and went to unconscious mode, bank people took my dad to a nearby hospital i.e Baptist Bangalore Hospital as an emergency. Doctors said that my father had a mild stroke in the left lower part of the brain for which he fell unconscious. 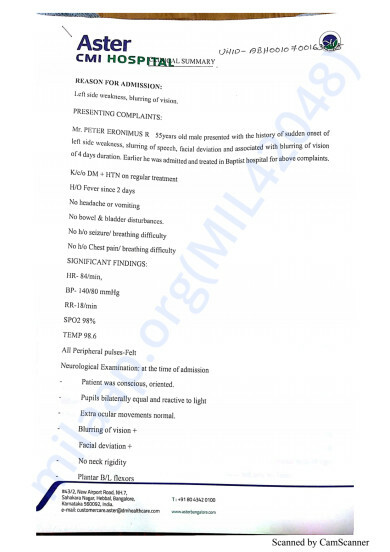 They took multiple scans, blood reports etc. After the MRI scan doctors confirmed that there is nothing to worry and asked my dad to go home and take rest for few days. Again on 5th July, he had a stroke and this time it is something else. After the stroke we took him to Aster CMI hospital, Doctors took multiple scans again and found some kind of white patches under the lower brain. According to them the patches are spreading across the brain. Doctors found these patches as some kind of Virus/Infection. Now my father is undergoing with a severe brain infection (Unknown) from past 2 weeks. The doctors are helpless as this is an unknown virus which can't be treated in a go. They suggesting us to leave my dad in NICU( Neuro ICU) for a duration of 3 Months. My father is in unconscious stage from a week time now. He lost his body sense, as this is related to the brain (Neurons) he slowly losing his memory. His health condition is very critical, as far as doctors told this is something related to Infection caused by Listeria Monocytogenus. Doctor words: Sudden onset of left side weakness, slurring of speech, facial deviation and associated with blurring of vision. 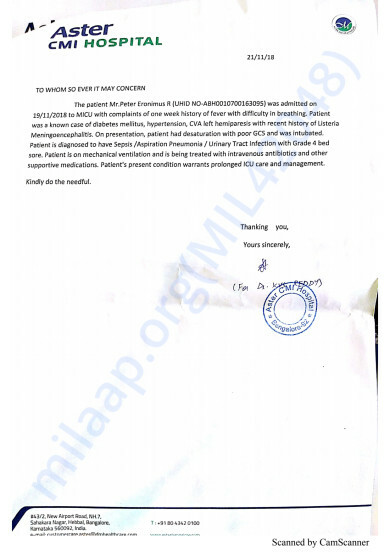 So far, we have spent a total of 11 lakhs on his treatment. I've given up my job to attend to him. Our money has run out. My father is still in the ICU, slipping in and out of a coma. 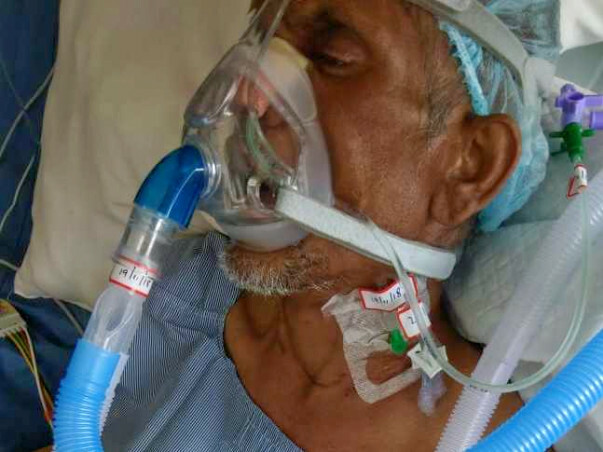 He struggles to breathe and his body remains swollen due to fluid retention. As of today (July 17th, 2018), Dad still needs critical medical care that includes keeping him on ventilator/oxygen support thus requiring a prolonged stay in the ICU for another 2 Months. This will cost us an additional 4000000 lakhs. My words are my everything now. Can you help me to get my father back? Dad is still same. There is no improvement. We are just on support now. 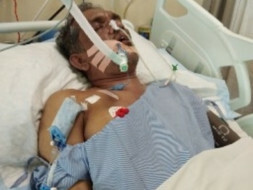 Without ventilator he is feeling difficulty to breath. He is sweating a lot. Infections are down. Only concern is his muscle power is totally gone. Doctors said we have only one option to push him...One option is just remove everything and just let it go 2nd is pushing him to breath. In this process anything might happen. He has lost all his muscle power. Dad was admitted in Aster CMI hospital. He is diagnosed with severe lung infection and deep pressure sore of 4th stage, which needs immediate surgery.Doctors advised for 2 weeks ventilator support in ICU and 1 week in normal ward. Current bill is sum of RS 309597/- till date for 6 days. Doctors suspect 3 weeks more for further treatment and surgery for pressure sore. The estimated cost would be around RS. 11 Lakhs. Please help me to recover this huge amount of cost. Spent over 20 Lakhs for the past treatment. I am in deficit of funds. So I kindly request you to help us. My father is out of the ICU, but he is still receiving treatment for brain infections in the hospital itself. The doctors say that since the treatment is related to the brain, they can't say how long the treatment will go on for. It could be from six months to a year. I'd like to thank you all for your continued support. Please keep sharing the campaign and do keep praying for him.